EARRINGS - SARAH COVENTRY. "WHITE SOPHISTICATE" FROM 1957. 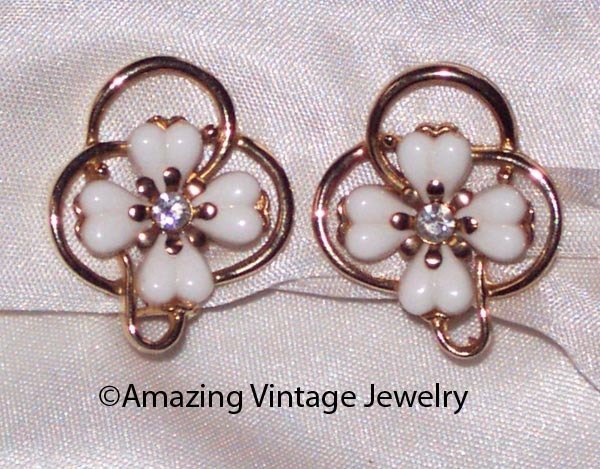 GOLDTONE LOOPS WITH 4 WHITE PETAL INSETS AND RHINESTONE CENTERS. CLIP. 1 1/8" LONG. 15/16" WIDE. EXCELLENT CONDITION. NOT MARKED BUT SOWN IN THE SARAH COVENTRY COLOR CARDEX FILES.